Assassin's Creed Unity is my least favorite major Assassin's Creed since the 2007 original. It's also the first Assassin's Creed that I didn't feel better about the more I played it. I didn't expect to be telling you this. Unity is a gorgeous game, which is just about the only high praise I can offer the Parisian adventure. Its campaign is dull. Its side-missions—usually among my favorite parts of these games—are dull. Its lead character, the Assassin Arno Dorian, is dull. The game's vaunted co-op is dull. I'd tell you that the game's modern-era gameplay was dull if the game had modern-era sequences, but in a first for the series, it doesn't. Unity feels like an attempt for the Assassin's Creed series to start over, to spare new players the complications of the series' centuries-old sci-fi conspiracy by minimizing references so severely as to make them entirely missable. They don't even call the Animus the Animus anymore. Now it's the Helix. Even some classic abilities don't return—unless you choose to upgrade your character to use them. The game feels like a test for a graphics engine that should lead to equally beautiful but more fun future Assassin's Creeds. Despite some hitches in framerate, it is a stunning sight. At times, Arno often appears to be walking through a painting. This is, after all, the first Assassin's Creed that Ubisoft has developed strictly for the new generation of consoles (and PC). Unity also appears to be an experiment to see how much Ubisoft can atomize a game and split it into tiny component parts, the better to aggressively adopt the gameplay systems and business practices of character-leveling, randomized gear collection, individualized characters, synced companion apps and optional and temporary microtransaction-fueled stat-boosting that can make solo gameplay easier. Whether these changes are temporary experiments or the result of a shift in Ubisoft's long-term goals for the series, the end result is a problem: Assassin's Creed: Unity just isn't very fun. 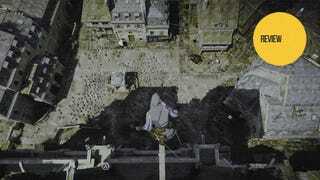 Assassin's Creed Unity is a land-locked adventure set in late-18th-century revolutionary Paris. Our hero is the assassin Arno Dorian whose sole interesting personality trait is that he is in love with a woman who is a Templar, the group in eternal rivalry with the Assassins. What Arno does in Paris is much of what assassins in this series have done in most of the previous major games of the series. Unity, after all, is essentially Assassin's Creed VII (they don't always put a number on them). It resists the currents of change that had swept the series toward fresher gameplay. Where the last two Assassin's Creeds deviated radically from formula to move the series into the non-urban American frontier and across the Caribbean sea—adding tree-climbing and shipwreck diving along the way—Unity brings us back to the series' urban roots. With that comes a lot of climbing up buildings and running across roofs, a lot of street-level swordfights and an incentive to get lost in a crowd after stabbing a target in the gut. That's not condemnable in and of itself, but Unity lacks the smoothness of control and the je ne sais quois of great mission design to tie everything together. On paper, in prose, Unity sounded great. They were going to fix the game's controls and building-climbing by adding a button command for climbing up and a different one for climbing down. They were going to fix the series' stealth by adding stickier cover and a dedicated crouch/stealth-mode button. They were going to make the campaign's assassin missions more open-ended, presenting them as squared-off sandboxes with multiple ways to kill Arno's target. They were going to let us finally have a significant amount of play time inside a city's buildings. They were going to fill Unity's Paris with dozens of side missions to keep solo players happy. They were going to add another new flavor to the series by making our hero a murder detective. The game's controls, despite having been refined over seven years of iterative Assassin's Creed games, still put up as much of a fight as any of the game's many sword-swinging bad guys. The up/down climbing buttons work great when you're on the roof of a building and need Arno to swiftly hop-and-climb down a building rather than leap off it possibly to his death. Unfortunately, the new scheme doesn't preclude Arno from getting stuck hanging on a weird ledge or other in-game object, sometimes dangling, unresponsive, a few feet off of the ground. The new crouch button lets Arno sneak up on people in a way that's more predictable and useful than the stealth controls in the series' earlier games. It's tied to the left trigger, and on paper, it works similarly to the generally excellent stealth controls in Ubisoft's Splinter Cell games. But it and the game's cover-snapping do not gel, in part because the game, frustratingly, does not allow you to corner around an object you're covering behind or easily snap from one piece of cover to another. Imagine you're in a room full of chairs and desks. A guard is walking back and forth. You've taken cover behind a desk where he can't see you. You've pressed the A button and you're "stuck" to it. The guard walks away from you and you want to sidle around to the side of the desk to get a bead on him before pouncing. You can't, because you cannot turn a corner while crouched and snapped to cover. You have to unsnap, creating space between you and the desk, risking detection, and then you have to sneak around the corner of the desk and snap again. This is not a hypothetical. It happens during the first big stealth mission. The assassination missions are indeed more open-ended and present a good template for re-thinking how major assassinations work in these games. Arno will survey a scene from afar, and the game will tell the player how many possible entrances and guards are around. It'll also mark areas of opportunity where Arno might, say, be able to convince some people to create a distraction. Some of these missions also offer Arno an opportunity to do a signature kill. I murdered my first major target in a church confessional, for example. Sadly, the number of entrances is not a useful stat, and the amount of guards might as well always be classified as "a lot." Worse, the missions just don't feel that different than assassinations in previous games, despite the new design approach. Assassin's Creed IV occasionally tasked players with needing to kill a target who was on board a ship, and deciding to do so by pulling him overboard, rushing his crew, or pouncing on him from the crow's nest felt at least as open-ended as anything offered in Unity. Being able to enter buildings is a pleasure, when it works smoothly. This is one of Unity's triumphs, and it'll be hard to go back to any Assassin's Creed game that doesn't let you prowl through many of the buildings in its cities. Unity's side missions—my favorite obsession of the series—are mostly a letdown. The main offering is a pile of Paris Stories that add little narratives to the sneaking, chasing, searching and other gameplay familiar to players of the series. Here you will have to track down severed heads for Madame Tussaud or investigate three water fountains where devilish murderers await. A man in a dress turns out to be great swordsman who wants you to win five duels. But we've done all this before, many times—the narratives supporting the side missions are a nice frame on familiar work. Just a year ago we were offered side missions that involved running through the jungle or spearing sharks or swimming through underwater caves to emerge amid angry men who we needed to defeat with our bare hands. We were sailing pirate ships through storms to unleash a fusillade of cannon shot into fortress walls and then running into the fortress to kill its commander. A year before that we were raiding forts, building a village and exploring a network of spooky underground passages. In Unity, the side missions are often a drag. In one, I had to rescue a prince from the second floor of a building. I entered through the window, killed his captors, went downstairs to kill some more, and died. I tried it again, clearing the first floor first, then rising to the second and slaying the men there. The prince complained that he could not go downstairs until the ground floor was clear of enemies. But it already was—the game just hadn't taken into account that I might have approached things that way. Another mission required me to guard a woman who was distraught over the execution of her husband. She walked slowly through Paris' streets and, for the most part, wasn't attacked. I kind of just walked with her, silently, waiting for the mission to end. The game's murder mystery missions are its best side activities. They turn Arno into a detective-mode Batman, requiring him to use his Eagle Vision to find and interpret clues. As he investigates a person's murder he'll come upon people to talk to and potentially accuse. Accusing the wrong person will diminish the mission's reward. A murder mystery involving three men who were attacked for being descendants of torturers stretches across several blocks of virtual Paris and shows the potential excellence of this style of mission. But they aren't all great—bizarrely, another murder mystery introduces just a single suspect. Guess what: They did it! The co-op missions feel half-baked. They are set in parts of Paris that the player may also have to visit for campaign missions. Co-op missions involve things like searching alleyways for clues, infiltrating heavily-guarded buildings to kill targets and, in one max-difficulty mission, enter a climbing-and-killing tournament in order to get close to four targets. The game offers players the chance to unlock some special co-op powers such as a shared Eagle Vision, but in practice, they simply play like slightly larger-scale regular missions that are easier when players divide and conquer. It can be satisfying to attack a map together, but the more people who are playing, the more people who are grappling with the game's finicky controls, getting spotted by the numerous guards, and seeing their plans go awry. While connected to other players you can also go on group stealth heists and even just run freely through the city, treating virtual Paris as the world's most beautiful chatroom. Nevertheless, the co-op feels like it's missing something. The Assassin's Creed series has long felt artful, sometimes shockingly so, given that each game is the work of hundreds of people. Unity, however, feels more like a game designed off of a spreadsheet. This is a game about math. At times that's a good thing. Arno is able to acquire and wear dozens of cowls, chest-pieces and the like, each of which modify the statistical performance of being an assassin. A specific cowl might increase the range of Arno's Eagle Vision. A certain chest piece might afford him another notch of health or reduce the ability of guards to see him by a specific percentage. All of this gear costs virtual money, though it can also be bought with an alternate currency that players can purchase with real money. The gear can all be upgraded using a third currency, that one earned (as is the main currency) by completing missions. It gets silly how many different currencies are in play. Players earn experience points for their every smooth assassination move—making a clean getaway, killing a guy with a finishing move, etc. What do you get for that? XP that eventually changes your gameplay-irrelevant assassin title. (I'm an Elite Enforcer now, in case you're wondering). As I said, the game feels like it was designed by spreadsheet. Much of that stat-affecting gear can be obtained by completing missions, though get this: you'll sometimes have to play a mission multiple times to get all of the gear tied to that mission. A trio of tonally distinct side missions offer the best change of pace in Unity (I won't spoil them here, but Ubi did spoil the best one). That's good. Not so good is that they are then chopped up and offered as seven more missions, their terrain now turned into an obstacle course where players have to fetch point-nodes while racing against the clock—and that, what do you know, they offer access to about 20 text files that appear to be the only elements of the game that advance the series' modern day story. If you're doing the math correctly, you've likely surmised that you have to play each level multiple times to access all the text files. Such is Unity's penchant for wasting your time with things that weren't even fun the first time. How about we press B and open it this fine Tuesday launch-day morning? I'm sure they'll get that fixed, but still. This wouldn't be so aggravating if there weren't other treasure chests that could only be opened if you have been using the game's iOS and Android companion app. Really? AC IV dipped into this a tiny bit, but it was easily missable. At this rate, though, why not add some treasure chests that can only be opened if I'm simultaneously playing a Rayman game on a second TV? I don't know the inner workings of Ubisoft, a company that has produced many wonderful video games, but is this a game or a shelf of products? Come on. I think the developers may have underestimated how intrusive this stuff can be, and the game has made me too sensitive to all of it. To wit: I've been adding fellow players into my Assassin's club (it's called "Kotaku" if you'd like to join before we hit the 50-player cap). If anyone in your club is trying to play a co-op mission, it turns out that a character that represents them will stroll right up to you and ask for your help… even when you're investigating a murder! So what is Assassin's Creed Unity good for aside from looking good? The campaign is okay, though it lacks drama or a surprising character arc. 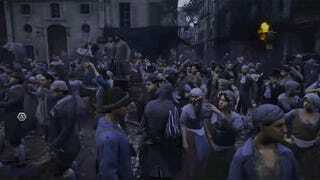 Ultimately, Arno is trying to deal with sinister forces that are causing problems for Assassins and the Templars. Arno meets a young Napoleon. They talk briefly. One highlight involves Arno running across rooftops to chase a hot air balloon. The graphics are astounding. They are not without technical problems... some pop-in, some chuggy framerates that will bother you if you have a low tolerance for that sort of thing (my game crashed on my Xbox One three times over the past several days, but Unity has also been patched a bunch already, so it's hard to tell how long-term these issues are). I was nevertheless happy with the game's performance, all things considered and what with the series' historical emphasis on visual detail and strong art direction over smooth, high-framerate performance. I wish I could say all these great graphics amounted to something, but the game's massive crowds turn out to be not very interesting. In theory citizens in the crowd will accuse you of crimes if they spot you being bad. They'll scatter at signs of trouble. They jostle around and make Paris look and sound alive. But their application to gameplay feels less relevant than the crowds of Assassin's Creed Revelations, who players could enjoyably manipulate by throwing all sorts of smoke, coin and blood bombs into their midst. And the new disguise perk, borrowed from the series' competitive multiplayer, makes sneaking into enemy territory all the easier. I keep going back to the mission design, though, and the lack of variety among the tasks available. Expansive as Unity is, the game just feels so narrow. Beautiful as it is, it nevertheless seems close to monotone. I played Unity with great disappointment, wondering how it went so wrong. As I played, I kept hoping the next sidequest or co-op mission would turn it all around for me. I wondered if I'd just grown tired of a series I've enjoyed for so many years. But I don't think it's me. I'm the Assassin's Creed guy at Kotaku. I'm the one who, generally, loves these games. Last year's pirate-themed Black Flag is probably my favorite, though I have very warm feelings for Brotherhood and the controversial AC III. I am crazy for the games' mix of historical settings, building-climbing, so-so stealth, weird conspiracy theories, strange modern-era missions, and their overall messy sprawl. I love that the series affords us the opportunity to play ambitious—if uneven—games year after year. I happily play the new releases every fall. I return to them in December or January to do any leftover sidequests. One or two of these games a year for me is not too much. Even as I write this, disappointed as I am in Unity, I'm optimistic about Rogue (also out today but I haven't played it yet) and the forthcoming Assassin's Creed Chronicles: China. I do think Unity illuminates some creative dead ends the series has wandered into. The city-based gameplay has been getting tired for years, and Ubisoft's designers may simply have run out of ways to make the climbing of churches and clock-towers appealing. (Perhaps it's time to climb an ancient pyramid.) The general sameness of the pedestrian-filled streets of virtual Florence, Istanbul, New York, and now Paris may mandate a shift toward urban centers filled with cars. The series' stabbing and swordplay may simply be oversaturated, the better to return to other means of combat such as pirate ships or minions of summonable assassins. It could well be that Unity's focus on co-op could beget a more complex way to maneuver through a city or kill enemies in groups. Maybe a Unity 2 could get co-op right, but to accomplish that, Ubisoft would have to overhaul their control scheme (yet again) and design missions that make stealthy feats feel special, sort of how they do with the best co-op modes in their Splinter Cell spy games. Unity's true flaw, though, is simply a failure to figure out what could feel fresh and fun for the series. I can imagine Unity with Shadow of Mordor's enemy-leveling Nemesis system and I suspect it would be a far more enjoyable game. I can imagine it with a more lively lead character or with more interesting missions in its Parisian underground. I can imagine it with sandbox assassinations that contain more optional mission tweaks. When I imagine those things, I also imagine a better game. That isn't the game Ubisoft made. They made what amounts to a showpiece for a new graphics engine, a game that will initially turn heads but which quickly reveals itself to be frustrating, repetitive, and dull. I've been happy with Assassin's Creed for a long time. Any series can have an off year, and hopefully Ubisoft will do better the next time around. But this year, for the first time ever, I'm telling you to skip the year's biggest Assassin's Creed.